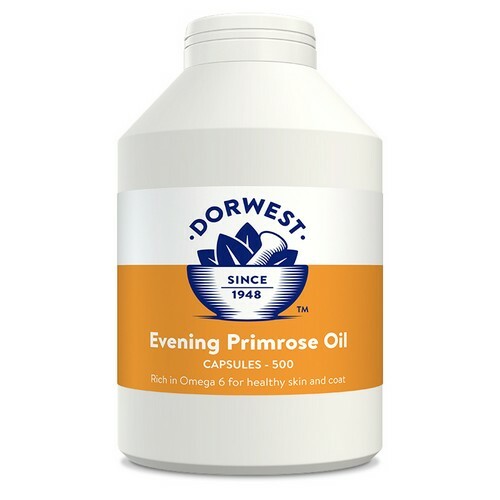 Dorwest Evening Primrose Oil capsules contain only premium grade oil with a 10% Gamma Linolenic Acid (GLA) content and have added vitamin E to maintain the skin in good condition. The high level of essential fatty acids in our Evening Primrose Oil make it excellent for maintaining healthy skin condition, reducing scruffiness and alleviating dry skin problems. The extremely high level of GLA in the oil used promotes coat growth and so is invaluable to give during the moult or where excessive hair loss has occurred. It is ideal for breeds with long silky coats and when given regularly it will maintain the good quality coat that these breeds require. Evening Primrose Oil is also well known for its stabilising effect on hormone imbalances. Veterinary advice should be sought before giving Evening Primrose Oil to animals that suffer from epilepsy. How Many Evening Primrose Oil Capsules Do I Need to Give? 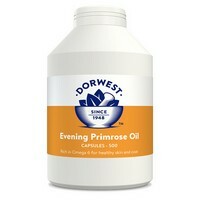 Evening Primrose Oil 500mg (10% GLA), Gelatin, Glycerin, d-Alpha Tocopherol (providing Vit E).